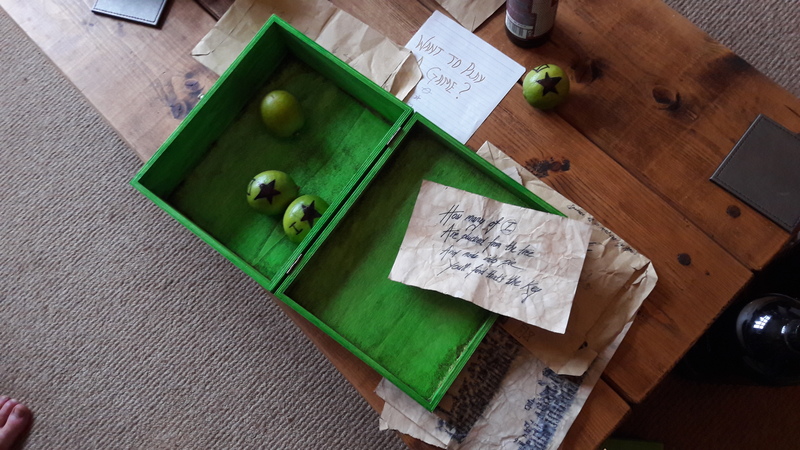 In my entry last week [That’s A Puzzlin’: Part I], I chronicled a little about the curious puzzle-box that Pete and I put together for a holiday I took with a two handfuls of friends at an impromptu board games retreat out in Devon last month. 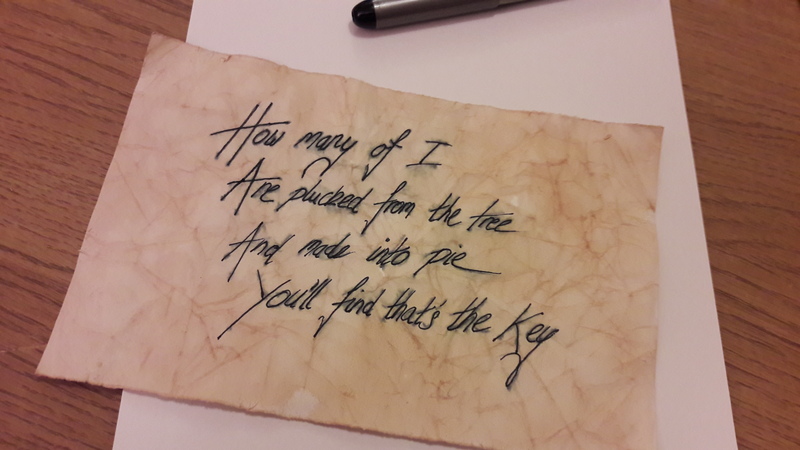 The purpose of Puzzle #2 (Lovecraft) was, in essence, to lead the player’s brains to think about using the Study as a hint mechanism for future clues involving books. 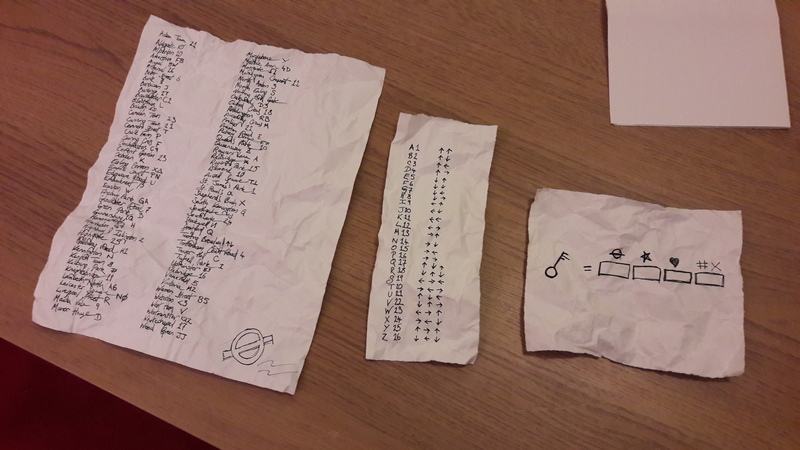 Pete had always wanted to put in book cipher as one of the puzzles; so, having pre-prepped a candidate book with which to hide a cipher in the form of coordinates to specific page numbers, lines and words, we dropped the envelope containing Puzzle #4 on the hallway calendar on Friday evening. I’d already hidden a copy of J. R. R. Tolkien’s The Hobbit on the bookshelf in the study when I placed the Lovecraft code within Puzzle #2, so all the players had to do for this one was to interpret the riddle and hunt for a copy of the book – which they dutifully did after a minor amount of head-scratching. Then, using the three-number combinations, they would then need to construct a sentence (to be even more accurate, a question) using the specified coordinates; likely using a bit of trial-and-error to work out what the number combinations meant before stumbling on the correct structure: [PAGE NUMBER] [LINE NUMBER] [WORD NUMBER]. The answer, of course, is nine; giving the directional combination (←↑) corresponding the runic ‘H’ symbol on the original “combination lock clue page”. Now, I haven’t (yet) explained the importance of this so, before I introduce the fifth (and final) puzzle of the game, I’ll briefly go into the meaning of it all. Early on, Pete and I had identified that, if we dropped the various directional combinations in order across the weekend, it wouldn’t be impossible for a brute-force method (of trying all of the combinations for the last code) to bear fruit once four-fifths of the code had been ‘unlocked’. To counter this, we aimed to drip-feed the combination parts not in order, such that the risk of brute-force entry would be minimised. To add an extra layer of puzzling to the game, the players would be given clues which associated with five directional combinations (associated with five symbols) which then would then need to work out what was linked with what. 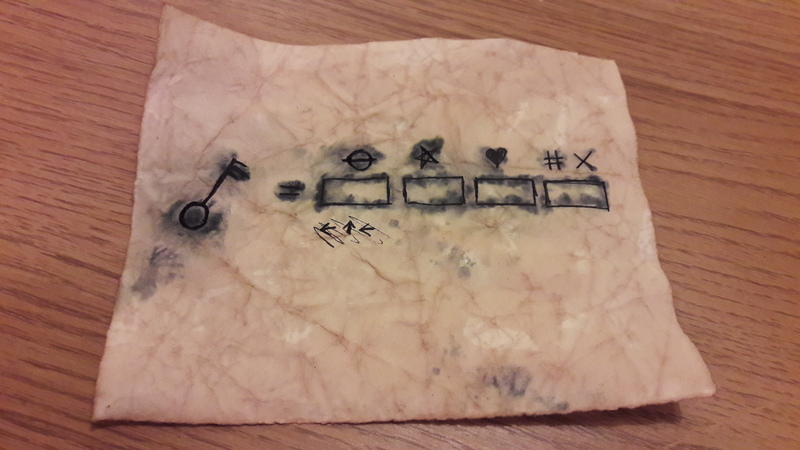 The symbols for each would be hinted at in the form of small markings on each of the initial clue envelopes containing each puzzle: Puzzle #1 (Jigsaw) had a rudimentary London Underground symbol; Puzzle #2 (Lovecraft) was a love-heart for obvious reasons; Puzzle #3 (Pigpen) had a ‘#X’ representing the two pigpen keys; Puzzle #5 (Limes) had a five-pointed star for reasons that will be revealed in the next section; but Puzzle #4 (Rings) had a runic ‘D’ because this is the symbol which is drawn on Tolkien’s map in The Hobbit marking the secret door on the Lonely Mountain. When placed all together, they would lead to a string of directions to be entered into the padlock, eventually releasing the goodies within. The fifth, and final puzzle, drew experience from a meme that has been orbiting our circle of friends for many years: the meme of hiding limes in each other’s houses. This tradition kind of started at the annual party at Dan’s house (“OckFest”) whereby limes would be hidden in bizarre places in Dan’s kitchen, intending them to be uncovered while performing unrelated tasks; for example: finding a lime in the box of Crunchy Nut Corn Flakes when pouring out the morning cereal; discovering a lime hidden inside the tube of kitchen roll when reaching to mop up a spillage; hearing a lime fall out of a hollowed-out French baguette when beginning to make a sandwich. Without wishing to blow one another’s trumpets too heavily, Pete and I are professionals when it comes to the international sport of Lime-Hiding. It was inevitable that we would initiate this tradition at The Winter Games 2017, but I forget which of us had the genius of incorporating it into the Puzzle Box game. Either way, the task for the players would be to figure out how many limes were hidden in a particular room, and then to use that number as the final directional combination. See? It’s a pun. KEY LIME PIE. Like, a key to a box that’s also a hint for the players to try and find some limes somewhere. On each lime, we drew a five-pointed star and a number specified in Roman numerals: however, the trick was that the limes would not be numbered consecutively. Overall, four limes would be hidden, with numbers I, II, IV and VI; the twist being that, if the players simply entered ‘six limes’ as the solution, they would be incorrect. Y’see, we had circled the ‘I’ in “How many of I”, indicating that the players should not – in fact – be counting the number of limes, but instead the number of ‘i’s in the numerals written on the limes; equaling five, yielding the directional combination (↓↑). Furthermore, the missing numerals (III and V) were simply a red herring designed to make the players hunt even harder. Yes; I know I’m a meanie. Because our original plan to hide limes in the kitchen became untenable because of the sheer people traffic that would be present in the kitchen at any one time, we were forced to change tack to hide limes in the games room annex where it was much easier to steal away time to distribute some fruit about the place. 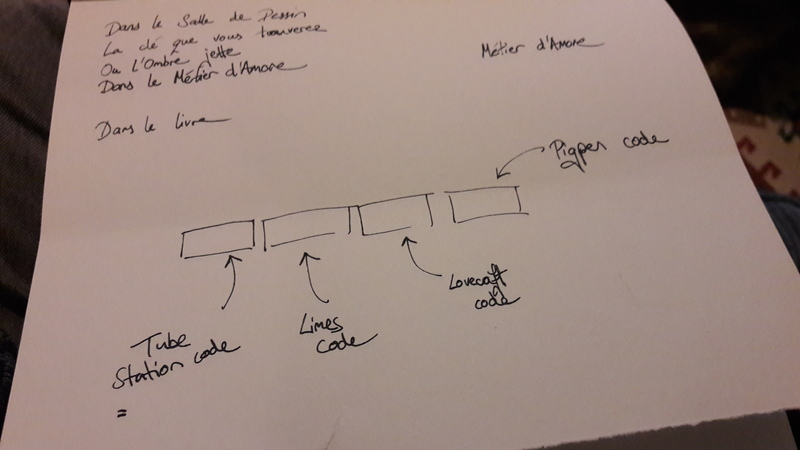 Hence, to do this, and while deployed at #TheWinterGames, I hastily mocked up an additional sheet of paper giving a hint towards the players looking in the games room by scribbling “Want to play a game?” and including it in the envelope right before deployment. 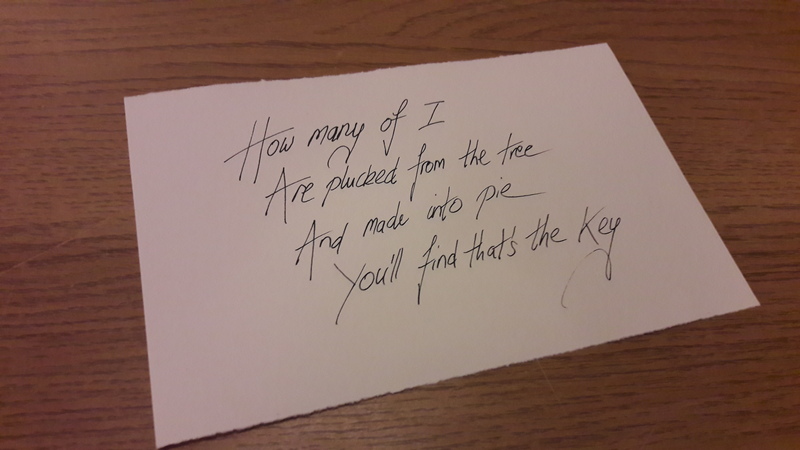 However, due to a simple lack of properly thinking through the implications of that phrase, we kind of didn’t realise that that’s also a quote from the movie Saw, spoken by the main antogonist, ‘Jigsaw’; causing everyone to suddenly barrel down the hallway into the Dining Room (where Puzzle #1 [Jigsaw]) was still set up, frantically searching for an answer. Secondly, everyone appeared to miss the “key lime pie” solution to the clue and instead immediately leapt to the solution of “four-and-twenty blackbirds”; since, like limes, these are also a Thing™ which can be found in a tree but also baked into a pie, according to the nursery rhyme. In retrospect, it was actually a little satisfying to have the players burrow down the wrong rabbit-hole in search of this unintentional red herring [let’s call this “Winter Games Puzzle Box Stroke of Luck #2”] but, at the time, it was immensely stressful to have to watch them struggle down a futile path and yet not be able to interfere, lest I give the game away. However, some gentle nudging highlighted that the solution was in fact ‘limes’; at which point, several reconnaissance groups were despatched to the various rooms of the house to hunt for round, green objects. After a short while, one of the search parties returned with four limes, and fairly swiftly cottoned on the Roman Numerals code; arriving at the answer of ‘five’. So, our players now had everything they needed to open the box; and open the box, they did. Also: I’d love to say that I’d planned to paint the box green to match the limes, but that was simply happy coincidence. So, with great expectation and encircled by a perimeter of excited (if still confused) faces, one plucky adventurer keyed in the winning combination (↓↑↓↓↑↓←↓→←↓←↑), undid the chains and, with mild trepidation, lifted the lid of the confusing green box. A map of the house, with an ‘X’ marked on in big, black pen. (Which Pete and I had to scribble in on location, after we’d figured out a good place to hide the prize). The ‘X’ on the map led the participants out to the back garden where, under the cover of darkness in the late hours of the previous night, I had wrapped the final prize booty in an old carrier bag under stone lawn roller in the approximate location of the ‘X’ marking. Following a brief period of scurrying and scouting, the booty was located by a tall, loud Spaniard and brought inside to the metaphorical sound of bugle-horns heralding the arrival of a monarch returning from a crusade. And so, with the ‘pop-thmph’ of the cork ejaculating from the bottle and reverberating off the living room’s wall, the adventure was over; the puzzle was solved. I’ll be honest: it was a heck of a lot of fun putting it all together and I adored the act of thinking to think laterally to come up with mysteries and conundrums that would (hopefully) confuse, but enthuse, an odd assortment of my friends. Undoubtedly, there will be another #TheWinterGames; where Pete and I join forces to do something like this again remains to be seen. Perhaps it’d be not quite as fun if the players knew who was doing it all, but perhaps that would give us even more scope to add complexity given that – in event of them getting “stuck” – they’d be able to ask for help. I don’t know, we’ll have to see what the future brings. Either way, it’s been mighty enjoyable recapping and documenting what happened in a wonderful house a month or so ago; and I hope it has been for you, too. Godspeed, puzzlers.